Planning a summer luncheon? Hey…summer is NOT over yet! I’m hanging onto it for dear life! 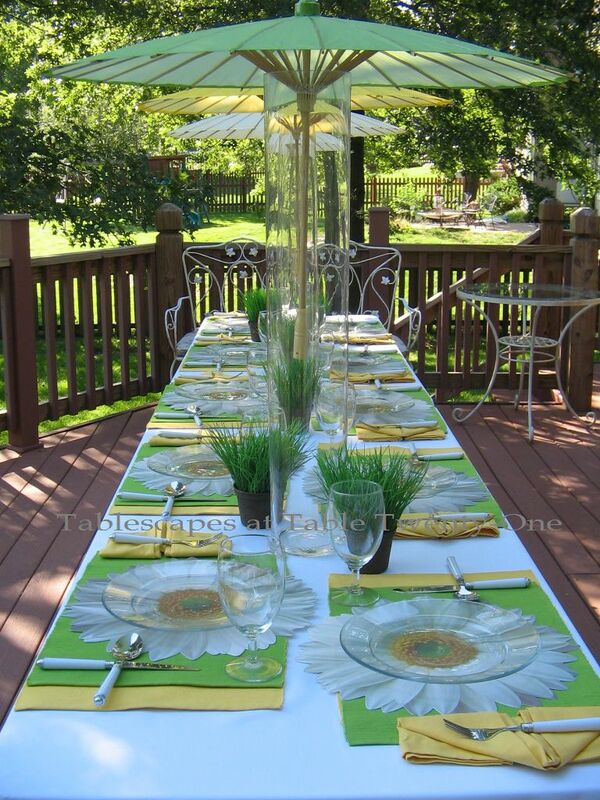 The proof is in this sunny yellow, green and white table that is perfect for a birthday luncheon, the girls getting together, or even a casual bridal luncheon or shower with a Gerbera daisy theme! Even with the hot August sun blazing overhead, a summer picnic on the deck is a perfect time to gather with friends. Got ugly or very generic outdoor tables like I do? Your most important table decor friend is a full-length white cloth that covers the top and legs with grace and style! 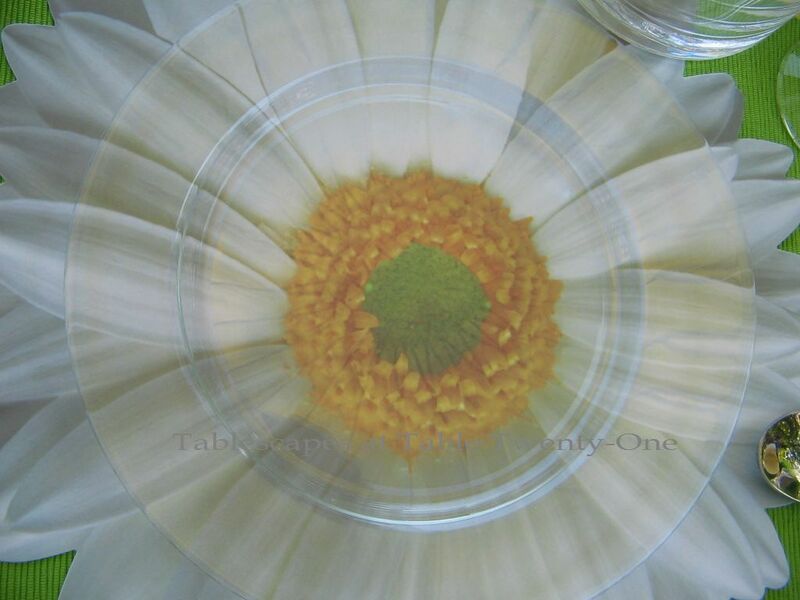 There are no fresh flowers used on this table, but you don’t miss them at all with the profusion of Gerbera daisies peeking out from underneath clear glass plates! 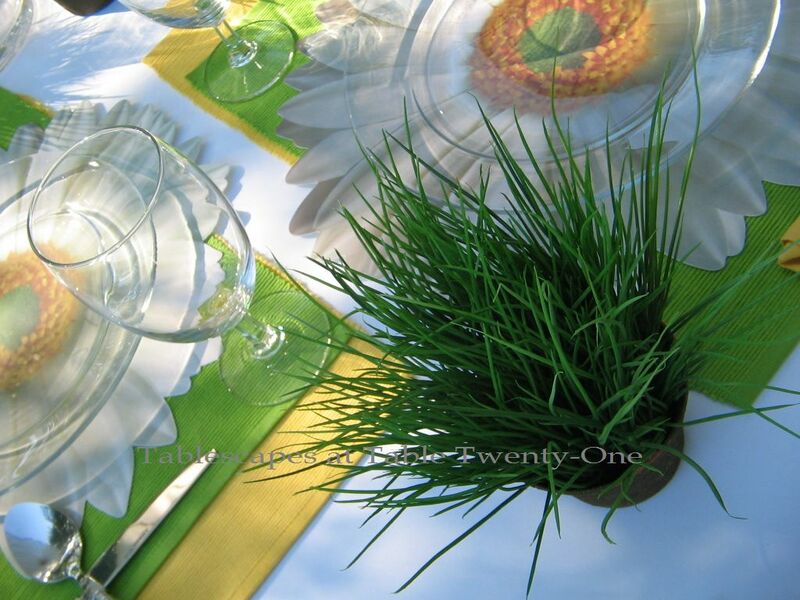 A triple stack of colorful placemats makes each place setting really stand out. Clear stemware goes great with the plates. All placemats and the plates are from Bed Bath & Beyond. 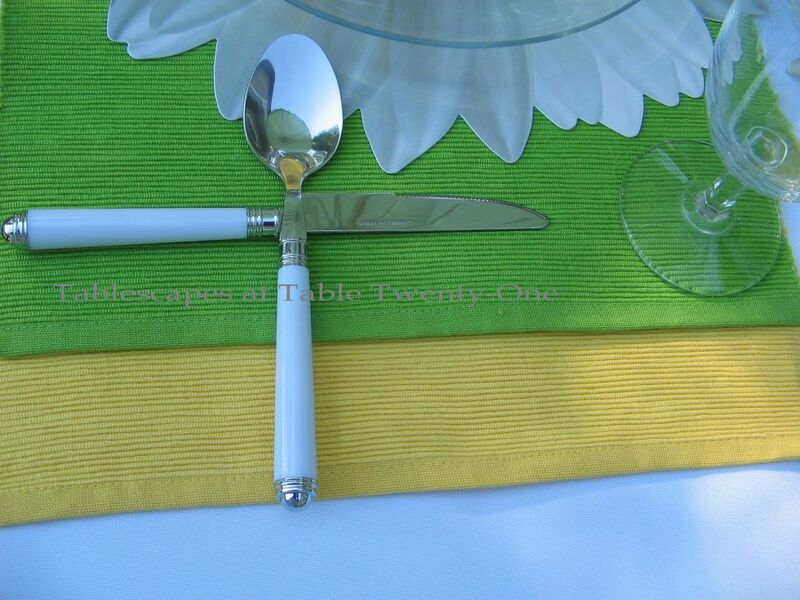 A maverick place setting like this calls for a fun twist on the flatware placement! The flatware is from TJ Maxx. 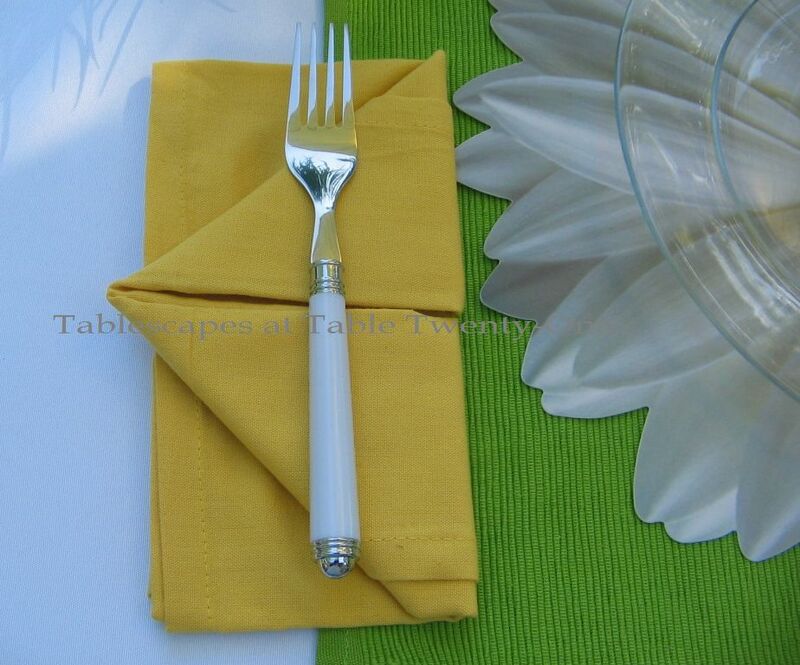 A fun napkin fold mimics the petals of the daisy. The napkins are from & Bed Bath Beyond. Grass in rustic pots brings color, texture and movement to the table. No money for fresh flowers and too early in the day for candles? Well, something has to make that centerpiece pop! 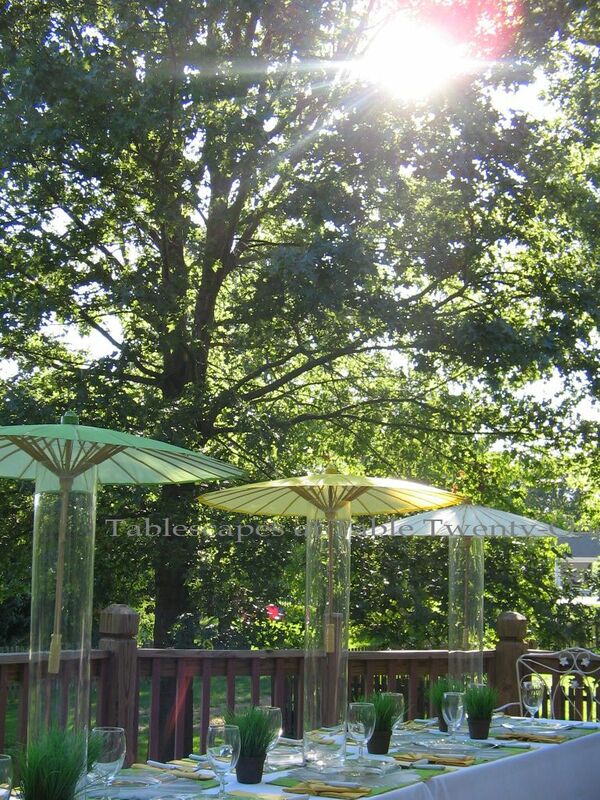 I used my trusty 31″H clear glass cylinders paired with colorful paper parasols from Hobby Lobby. Just plop ’em in! They look great and provide much-needed shade on a warm afternoon! If you missed “Candle in the Wind” – my tribute table in memory of Diana, Princess of Wales – you can see it here. Beautiful fuchsia flowers, lots of silver…simple, but befitting the memory of a princess! Thanks for stopping in, and please join me as I visit Susan and the other tablescapers at Between Naps on the Porch for Tablescape Thursday!!! Thank you, Christine! Those clear glass cylinders come in handy for so many cool decorating ideas!!! I can’t get the hang of using that cutting tool to get shapes cleanly cut. That would be such a wonderful way to create cool stuff to go underneath, but I just can’t seem to steady my hand. I think I suffer from a little something known as “impatience”!!! 🙂 But don’t count me out for more summer tables just yet. It’s still sweltering and humid as heck here. I just can’t bring myself to look towards fall yet! This is just so creative and colorful! I would be thrilled dining at this fun table. It sets such a festive mood even before the party begins! LOVE everything about it, Alycia! I’m telling you, Yvonne, if you’re ever in the Kansas City area…!!! 🙂 Thanks for stopping by! Hi, Mona! I’m so glad you like the parasols! I love working with them in different ways when I can! I love every thing about this! You are downright brilliant to figure out a way to bring daisies to the table without even using flowers. The clear glass over the daisies is perfect, and I LOVE the parasols in the cylinders. That was the first thing I noticed. Hi, Debbie! Isn’t it fun not to have to spend all the fresh flower money but get a great effect just the same?!??!! I bought the daisy placemats at the end of the summer season, so they weren’t very expensive at all. 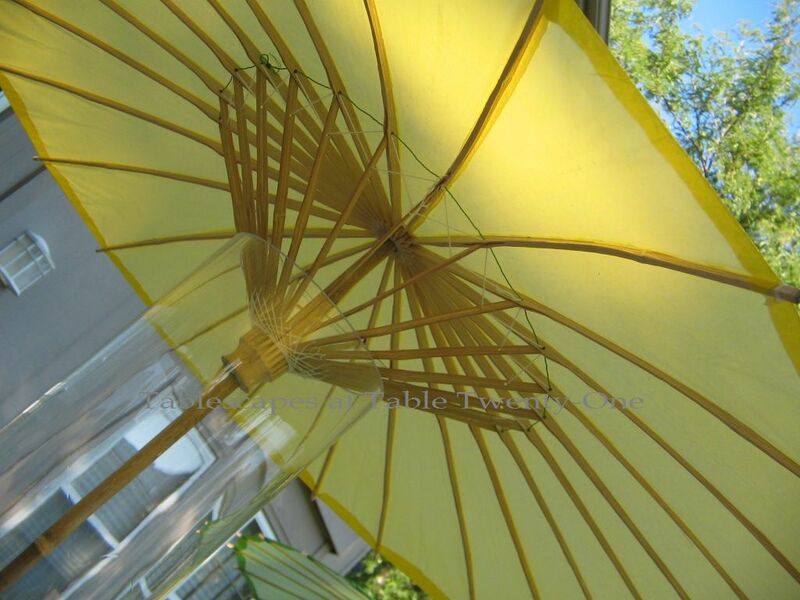 As for the parasols, I happened to prop one up in a tall vase one day to repair it, and an idea was born! I try to get as much use out of those glass cylinders as humanly possible. They are my “go to” piece for the table! Thanks for stopping by! When I was in college, I had a wonderful authentic Bagasa that I adored. 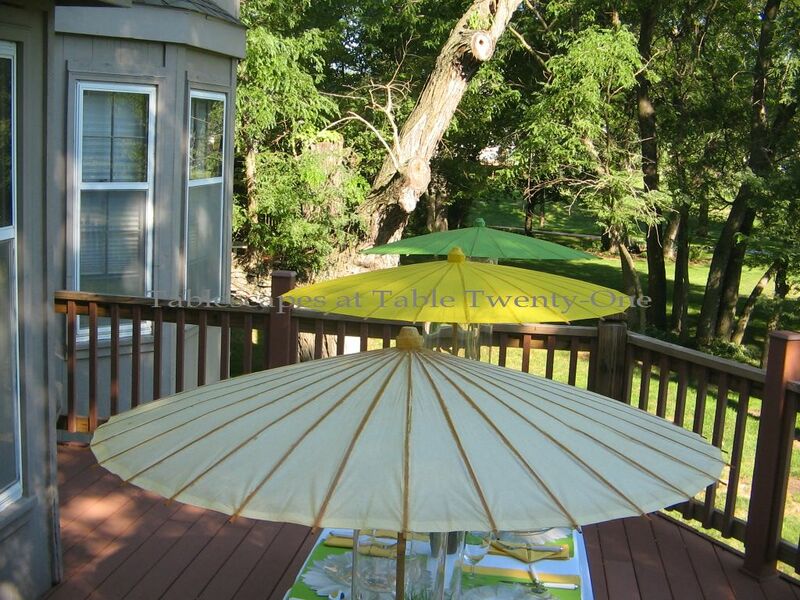 Your parasols are perfect for your back porch luncheon…such a marvelous tablescape. Clever to display them in the tall cylinders. I’m going to make a run to Hobby Lobby to see if we still have them. Did you know that Hobby Lobby started in Oklahoma? We’re very proud of this marvelous company. Thank you for sharing your lovely design. Oh my goodness Alycia. I love the table. Those umbrellas are genius. Fabulous all the way ’round! Wow what a fabulous table Alycia! I love your placemats. Everything is so fun and refreshing. Great job! Thank you, Jocelyn! I figured I HAD to do something different with those plain ol’ cotton placemats, and doubling up on them seemed the perfect solution! I love the umbrellas in the tall vases. I had umbrellas in mine today too! Great minds….. This is really pretty and feminine. I love the yellow and green and the fresh grass is such a fun touch. Of course the umbrellas are the star! I may have to find some for myself (mine were my SIL’s). Great setting too. Hey, Jacqueline! Yes…I SAW those pretty white parasols in that uber-feminine post! You put an awful lot of work into that!!! Yours looked like fabric, though. I would love to have a bunch of colorful fabric parasols! The paper ones are so fragile. But they’re inexpensive, so I guess that makes up for it! Thank you!!! High drama….that would pretty much describe my life of late, so this table must be a reflection! 🙂 Have a great weekend! Another winner, my friend! I love that you posted not one, but two, spectacular outdoor settings this week! I lost track of the number of clever, creative ideas you shared in this one. You’re generous to share your innovative artistry with us, along with invaluable tips, tricks, and techniques for terribly terrific tables! (How ’bout that amazing alliteration???). I love your table, Alycia. I love how you used the umbrellas. Sweet!! I also like the layers of place mats and then the clear plate. So nice, and summery! Thank you so much for stopping by “Take Six”. Alycia, your table looks so refreshing for a summer party. All the elements are fresh, clean, and to the point, and the addition of the tall cylinders gave the table drama. I love this one, thanks for sharing. Thank you!!!!! I’m glad you like it!!! Thank you so much, Fabby!!! Alycia, Love the tablescape (have been a quiet fan for a while now). Just to clarify… where did you find the 31″ vase? Hi, Laura! I am so happy to hear you like this one! The whole thing was kind of accidental. I was trying to repair a little tear in one of my paper parasols one day and needed something to prop it up. Guess what was sitting nearby? 🙂 A tablescape was born!!! I have several of those 31″H cylinders. I think I bought them at either TJ Maxx or Marshalls/Home Goods several years ago. They are my “go to” decorating staple! I still see the glass cylinders around from time to time at TJ Maxx, but I haven’t seen them that tall in awhile. If you have an Old Time Pottery nearby, you might try there, too. Thanks for stopping by, and have a great weekend! 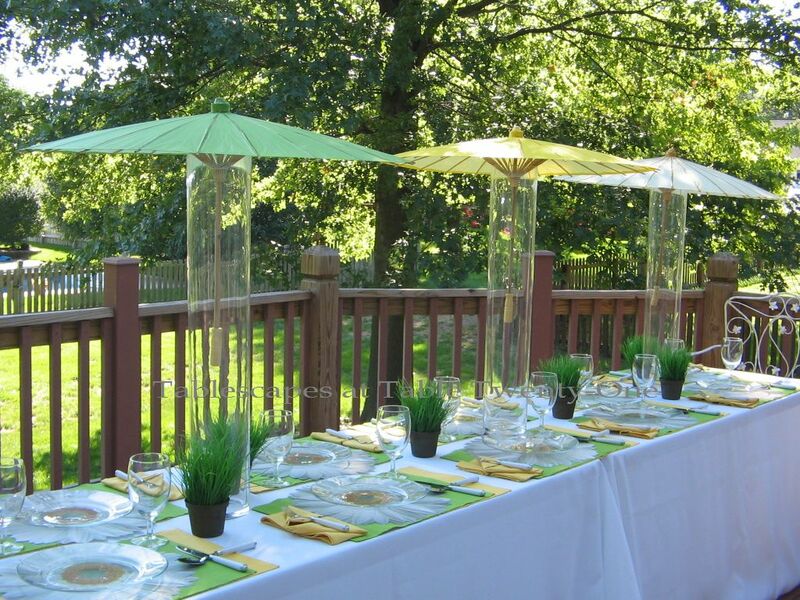 What a cute idea with the parasols! Looks very festive as well Alycia!Love it! Love, love, love the centerpeices…what a clever idea! The tables are so pretty and refreshing! You did a great job! Thank you for stopping by Sweetladyelaine’s I appreciate your visit. Thank you, Miss Elaine!!! Have a good weekend, and I’ll see you next week! You had me at the parasols, I love it! Now I need a Hobby Lobby! Fresh as Daisy table, no oopsy about it! Love those cylinders, I mean umbrella stands! You cracked me up with your comment on my blog. Nope, you are none of those things I attributed to Irene. Not at all! Hey, Kathleen! I STILL think you were talking about me on your blog. If not, you’re in the minority!!! 😉 🙂 🙂 That’s OK…I’m used to it! 🙂 Hey…I”m glad you like the parasols! I have a weird “thing” for them. You DO need a Hobby Lobby! We need to lobby the hobby people to bring a Hobby Lobby there! Cherry Kay of Entertaining Women told me that Hobby Lobby originated in Oklahoma. I had no idea! I guess it’s just taking its time moving north and east. Let’s get a letter campaign going! Oh my! Such originality! Those umbrellas couldn’t be cuter. It all is so fun but yet classy! Hi, Donna, and thank you so much for stopping by! I’m glad you like it!!! Dreamy, summery and refreshing table! Very elegant. Love the outdoor setting. Alycia, First let me thank you for your wonderful comments on my first tablescape and blog post. It means alot to me that you took the time to welcome me so warmly. As usual, I love your entry this week, especially the parasols. They remind me of a huge cocktail you would have on vacation! Looking forward to “partying” with you in the coming weeks. Hey there, Robin! Thank you so much for stopping in to say hi! I was delighted to see another new tablescaper, and I really do look forward to seeing all the fun designs you will bring to the party. I am surprised that I didn’t make the connection between the parasols on here and a big ol’ tropical drink! That’s funny!!! Have a great weekend, and I’ll see you next week! Wooo HOooo! I adore this! So adorable summer springy!! I have the outdoor ugly tables and I love all your great ideas of staggering etc! Comes in very handy when I am hosting a party! Ya, I had to sneek in a New year’s eve party, but I think I have to sneak in a couple more holiday themes so I can get ready for the big days……it takes me awhile to be creative!! Hey, Wendy! I liked your New Year’s table! You’re ahead of the curve! 🙂 Thanks for stopping by. Those outdoor tables I have are just those crazy standard 6-ft. tables with the ugly metal legs. I work hard to conceal those bad boys! I am holding out for some beautiful heavy wood tables with benches. That would be so great! I could use different pillows nad pads on the benches…..aaahhh, bliss! As for the staggering of place settings, I actually find that I get kicked less under the table with this method! Have a good weekend!!! Hello Alycia. I love the spelling of your name by the way. thanks for visiting my blog and leaving such kind words. I have to tell you, I adore your tall cyclinders and umbrella combination. It’s spectacular and so very cute. You create wonderful tablescapes and it is always a pleasure to view them. Hi, Linda! Thank you so much! I’m so glad you stopped by this evening. I was back on the Horchow website earlier this evening, dreaming and planning. Your post this week really dredged up that itch again! Have a great weekend! WoW! Love those paper parasols in the acrylic cylinders! So striking and yet fun at the same time. Only you would have thought of something so creative. 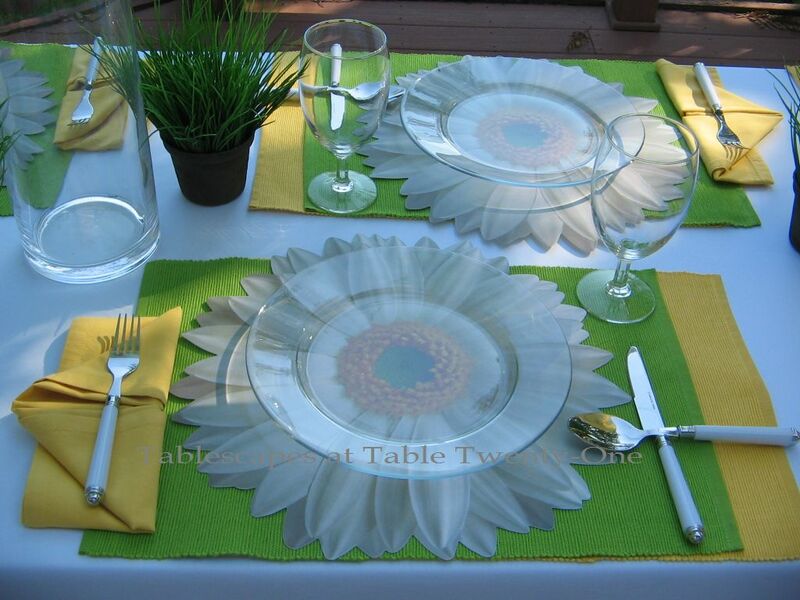 Love the citrus colors and the daisy placemats. The whole tablescape is so summery and fresh. Love it. Hey there, Babs! Welcome back!!! I am holding onto summer for dear life!!! I refuse to give it up just yet! I love your Gorgeous Tablescapes. 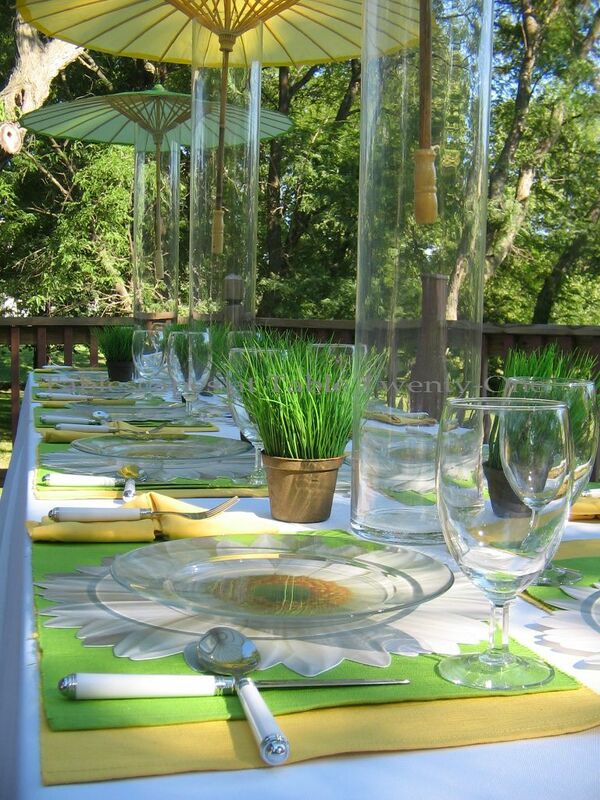 I also love the paper parasols on your tables Beautiful for this dinner party. I would love if you could come over and see my new Tablescape I just put on today. I hope you have a great week.